But fear of losing the world emerged. Then from the greatness of the Creator! The Creator can be held if you seize Him with ten pairs of hands. If I awaken ten friends, together we will be able to grab the Creator as a baby grabs his mother and does not let her go. In the measure of our unification, we can adhere to the Creator. Until the Temple is rebuilt—the relationship of mutual love—it’s as if it collapses daily, and increasingly selfish relationships are #revealed.To rebuild #Jerusalem (Ira-Shlema, absolute awe): without help from above, we won’t achieve the equivalence with the Creator. 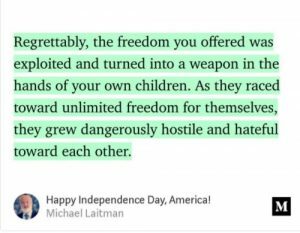 “Regrettably, the freedom you offered was exploited and turned into a weapon in the hands of your own children. 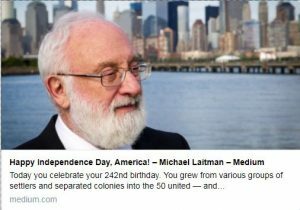 As they raced toward unlimited freedom for themselves, they grew dangerously hostile and hateful toward each other.” from “Happy Independence Day, America!” by Michael Laitman. To see the world through the Creator’s greatness? Great. Greater than the world. Are you still in Him or already out? That shined on desires of love. #Freedom is the product you always promoted in the global arena, the brand ideal you presented to humanity, the dream you inspired in all of us. 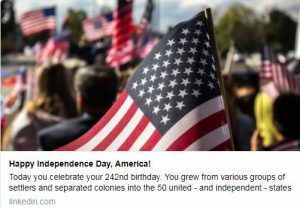 Regrettably, the freedom you offered was exploited and turned into a weapon …. 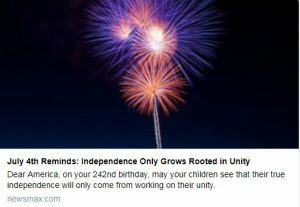 On your 242nd birthday, may your children see that their true independence will only come from working on their unity. The Temple’s destruction is in us! The Temple had to be destroyed. Today we understand that what broke was the Kli, the connection existing in the nation, the group Isra-El, those who aspire “straight to the Creator”—so we’d start realizing the breaking and correcting it, till love in Lishma, total bestowal. Without a broken connection among the nation, there is nothing to correct! We can only learn from mistakes. Purely formal execution of the Commandments won’t correct the nation, won’t unite it with the Creator. This is the difference of opinion between religion and Kabbalah. The Second Temple was destroyed because the fulfilment of the Torah, Commandments, GMAH (helping a friend) assumed the goal of earning paradise (world to come), power, money, i.e., became egoistic actions for their own benefit, not for LISHMA. That is what led to the destruction. Working in the Temple is work toward unity. All of man’s qualities: still, vegetative, animate, and human levels, must be included in the unity and work for bestowal, which is called the work of the Cohens. This is the holy temple service in love. Unfounded hatred is revealed only in the efforts to unite. We must expose this evil and ask for its correction—we unite in the corrected qualities and create a vessel for the Creator’s revelation. This is the reason for the Temple’s creation—in our hearts—desires. If we exert effort toward unity in order to fulfill the thought of the Creator and bring creation to correction, then we will see that we cannot do this alone. That is why we turn to the upper force with a prayer, we raise MAN, and then as an answer to MAN, we receive the power for unity. In this unity, which is achieved with the help of the reforming Light called the Torah, we begin to reveal the spiritual life, the higher degree, the Creator; that is, the upper force of bestowal and love becomes revealed within the correct connection between the parts of the collective soul. And we reveal a power of unity and Light that is 620 times greater; in other words, the Creator is revealed to us 620 times more powerfully than before and that is why we can finally notice, feel, and connect to Him. If we have no great need for correction and our closeness to one another does not reach the necessary strength to draw the Light that reforms, then we will not receive the Torah. The Torah is a special power of Light, which acts on our efforts toward unity when we desire it greatly but still discover that we cannot achieve it. The difference between the desire and reality that triggers pain and a tremendous need for correction in us is called MAN (female waters). In other words, the great difference between Malchut (the female property) and Bina (water) is revealed. We greatly want to unite, to rise to the level of Bina, but we find ourselves on the level of Malchut. And this chasm triggers a reaction from the Creator, the upper force, the Light that reforms, which acts on the chasm that we discovered between Malchut and Bina, between our natural desire to receive and our aspiration to be in bestowal. If we discover this chasm between us, then we can reveal the upper Light, which will act on it. Light corrects the chasm and fills it with the Light of unity. Our desires unite together and the Creator is revealed within them. If we cannot discover this chasm with enough strength, then it means we are on the level of the “patriarchs,” to whom the Torah had not yet been given, that is, in the state prior to correction. We continue to exist only thanks to the support of the upper force, which awaits the time when we will be able to progress under our own power. This is a short stage on the path toward correction, which needs to be completed as quickly as possible. There are several exercises for reaching a prayer to the Creator. First of all, it is necessary to acknowledge that we already, in truth, have a connection with the upper force and we exist in the field of its action. Otherwise, we are like children who in their naiveté do not suspect that the mother constantly watches them and think that they are on their own. The group must constantly give us the sensation that we exist in the force field of the Creator. In reality, the Creator fills the entire world, but this experience is hidden from us. However, the friends, the group, are able to give us such a sensation. And even though I myself do not feel my dependence on the Creator, do not feel His moment-by-moment influence by which He insures my existence, corrects and guides me, the group can awaken these sensations within me. We must show our friend that he has a connection with the Creator, and this is the main thing—everything else is just supporting means. This brings us to the sensation of our dependence on the upper force, at first egoistically, for ourselves, to make it better for us. However, then I begin to think about making it better for us, because it is impossible to awaken the Creator alone but only in a ten. The more tens start to work like this, the greater our strength and our chance to awaken the upper force becomes. We will feel how the Creator draws closer to us. This is how we gradually develop our senses; this is our entire life’s work, all our spiritual development. We must seek out such changes that will bring us to the awareness of evil, the darkness between us. What does it mean that “we awaken the dawn” (the darkness before the dawn)? I reveal the blackness, the darkness, the deficiency in our relationships, which I had not seen earlier because of the strength of old habits. But I became uncomfortable as a result of the changes that were made. This does not mean, however, that I quit, that I no longer come. In awakening the dawn, we create the place for the prayer, we learn to turn to the Creator. It is the only thing we need: to clarify the deficiency related to the path, then we ask, we demand the correction from the Creator, for Him to advance us. We will find ourselves in such states that we cannot change or correct by ourselves. But we will discover exactly what needs to be corrected, what is happening to us. On the path of “hastening time” (Achishena), we must look for the darkness ourselves, like the hunched over old man who walks and searches as if he lost something. We must awaken the dawn ourselves, learn to walk by ourselves, like a toddler learns to take his first steps. This is a new and a very important stage: to teach us the correct relationship to destiny and the correct use of the upper force. This is the path by which we enter the work in Achishena, when we are no longer just pulled forward or pushed from behind, but we ourselves initiate and formulate our steps. Is There Freedom Of Choice Between Good And Evil? Question: Does my longing for feeling spirituality and the Creator become stronger or weaker with time? Answer: The yearning for the Creator grows. Until one reaches spirituality, one’s desire for it constantly increases, in confusion and misunderstanding. Question: Do I accept the growing yearning with joy? Answer: There are different nuances here that you will no longer notice and you will stop paying attention to them. Naturally, there are all kinds of circumstances in the group: sad ones, funny ones, annoying ones, and so on. But friends have to understand that if they are in a tense internal state, then they have to go through it all, and that they still have a lot ahead of them. What Is A Spiritual Necessity?